Have you ever wondered how you are going to move any of the large garden planters you purchase from Arizona Pottery? Especially after they are filled with soil and plant materials? We have the solution for you! It is a superbly engineered tool designed to help gardeners safely and easily move heavy, awkward to lift objects, such as Large Flowerpots - Tree root balls - Hay bales - Landscaping stones - Firewood rounds and heavy bags of cement, mulch or feed - just to name a few. Can you think of other items? How about a large pumpkin on Halloween, or a large snowball when making a snowman. The Pot lifter has been painstakingly engineered for dependability and ease of use. 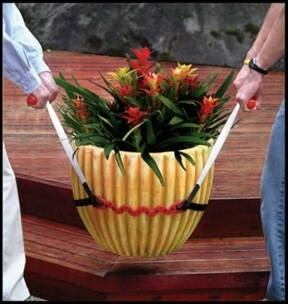 Each Pottery lifter folds up and slips into a drawstring bag for easy storage.